Beautifully engraved certificate from the Pan American Airways Corporation issued in 1933-1937. This EARLY Pan American Airways Certificate was printed by the Quayle & Son Company and has an ornate border around it. This item has the printed signatures of the company’s president and founder, Juan Tripp and is over 64 years old. 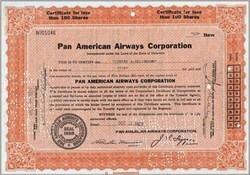 The early Pan Am certificates are quite scarce. 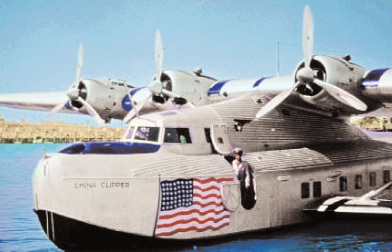 We are also including a postcard of an early China Clipper (Martin M130) shown in the late 1930's at Treasure Island in San Francisco Bay. An Atlantic Opening In July 1931, Boston-Maine Airways began operating a mail route from Boston to Halifax. Boston-Maine was created by the Maine Central and Boston and Maine Railroads but operated under contract by Pan American. This was an ideal situation for Trippe . Not only did his company gain additional operating experience in northern climates, headed in a direction he wanted to go anyway, but he got paid for it as well.